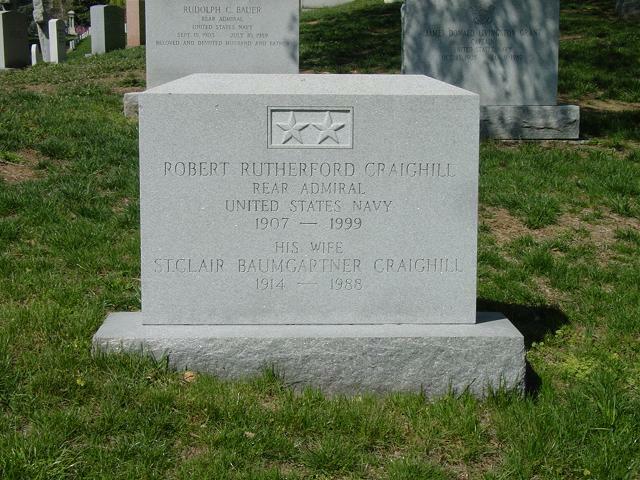 Robert Rutherford Craighill, 91, an Episcopal priest and retired Navy Rear Admiral who received the Navy Cross as a commanding officer of a destroyer that shot down seven enemy aircraft near Okinawa during World War II, died of respiratory failure April 19, 1999 at the Bethesda Naval Hospital. According to the citation accompanying the Navy Cross, the Navy's highest medal for valor except for the Medal of Honor, Admiral Craighill exhibited extraordinary bravery as commanding officer of the destroyer USS Brown, which during a two-week period in 1945 shot down seven enemy aircraft and provided fighter direction in the shooting down of eight more. His service didn't always end with such positive results. In August 1942, he was a battery officer on the light cruiser Vincennes when it was sunk by a Japanese force at the Battle of Savo Island. One of more than 700 survivors, he spent several hours in the water before being rescued. His other commands included a destroyer division, an amphibious squadron and the attack cargo ship Rolette. Before retiring from the Navy in 1959, he was assistant deputy chief of naval operations for fleet operations. In civilian life, he briefly worked as a consultant for the Department of State and later served as director of development for St. Stephen's Episcopal School in Alexandria. He entered the Virginia Theological Seminary in Alexandria, from which he graduated in 1975. He was ordained to the Episcopal priesthood in 1976 and spent 22 years as associate rector of St. Michael's Church in Arlington. He retired in September. Admiral Craighill was born in Oakmont, Pa., and raised in Washington, where he graduated from Western High School. He was a 1930 graduate of the U.S. Naval Academy in Annapolis, where he excelled as a varsity wrestler and soloist with the choir. His wife, St. Clair B. Craighill, died in 1988. Survivors include three children, retired Army Lt. Col. Robert R. Craighill Jr. of Round Hill, Va., retired Navy Capt. John S. Craighill of Annapolis and Cindy C. Archer of Washington; and nine grandchildren. His wife, Craighill, St Clair Baumgartner Craighill, November 13-1914-January 31, 1988 is buried with him. On Monday, April 19, 1999, ROBERT R. CRAIGHILL, beloved father of Lt. Col. Robert R. Craighill, USA (Ret. ), of Round Hill, VA, Capt. John S. Craighill, USN (Ret. ), of Annapolis, MD and Cindy Craighill Archer, of Washington, DC. He is also survived by nine grandchildren. A memorial service will be held at St. Michael's Episcopal Church, 1132 N. Ivanhoe St., Arlington, VA on Monday, May 10, 1999 at 9:30 a.m. followed by interment at Arlington National Cemetery with full military honors at 11 a.m.